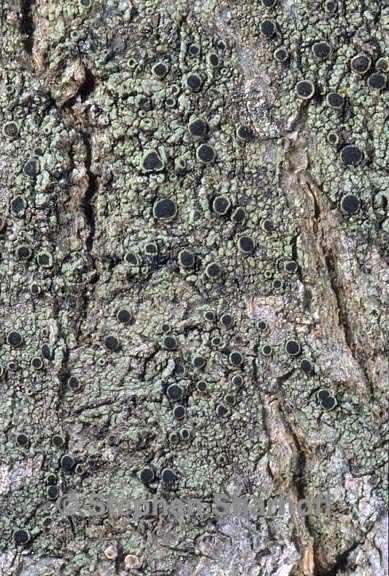 Thallus: crustose, thin or thick, rimose or areolate, areoles up to 0.6-1 mm wide, plane or rugose, sometimes comprised of discrete verrucae, c. 0.2 mm in diam., that merge to form an uneven or verruciform thallus surface: dark gray to gray-brown, dull; margin: determinate on smooth substrates, more commonly indeterminate; prothallus: lacking; vegetative propagules: absent Apothecia: adnate, sometimes almost innate or erumpent, frequent and often contiguous, 0.5-0.9 mm in diam. disc: dark brown or black, plane, rarely becoming convex or half-globose thalline margin: 0.05-0.1 mm wide, entire or flexuose, persistent; excipular ring: often present, red-brown, confluent thalline exciple: 55-80 µm wide laterally; cortex: 5-10 µm; epinecral layer: absent or c. 10 µm wide; cortical cells: up to 4.5-6 µm wide, pigmented or not; algal cells: up to 9.5-15.5 µm in diam. ; thalline exciple: expanded to 40-100 µm wide below; cortex: 10-50 µm, cellular proper exciple: hyaline, 5-20 µm wide, expanding to 10-40 µm at periphery hymenium: 70-100 µm tall; paraphyses: 1.5-2.5 µm wide, not conglutinate, with apices up to 3.5-5 µm wide, heavily pigmented, forming a dark red-brown epihymenium; hypothecium: hyaline, 40-80 µm thick asci: clavate, 45-70 x 14-19 µm, 8-spored ascospores: brown, 1-septate, ellipsoid, type A development, Physconia-type, (16-)19-20.5(-23.5) x (7.5-)9-9.5(-11) µm, with thick apical walls and broad lumina canals at first (Physcia-like), lumina quickly becoming rounded and spores thin walled; torus: present in most spores; walls: not ornamented Pycnidia: not seen Spot tests: all negative Secondary metabolites: zeorin (trace) and unidentified substance 4/5/5 (trace). Substrate and ecology: on conifers and frequently on wood, sometimes in nutrient rich environments such as the base of tree trunks and their exposed roots adjacent to trails, at elevations of 1000-3500 m World distribution: widespread in Scandinavia and Siberia, also know further south in Europe, and North America (very similar to distribution of R. juniperina but extending further north into Montana and Alberta, and west into California) Sonoran distribution: southern California and Arizona. Notes: Rinodina archaea is perhaps most closely related to R. trevisanii. Their Physconia-type spores at maturity are characterized by relatively thin and elongate lumina canals during early development. This character is, however, more apparent in European than North American material that was recently described as R. lignicola (Sheard & Mayrhofer 2002). It is now apparent that more rapid development of the spores in North American specimens only makes this feature more transient and difficult to observe. Rinodina archaea is otherwise easily distinguished from R. trevisanii by its larger spores, thicker thallus, and apothecia that typically become contiguous and sometimes angular by compression, the plane apothecial discs, and thalline margins that never become biatorine.